Kia ora, my name is Hannah West. I am a year 5 teacher at Pt England School in Auckland, New Zealand. I teach in an innovative learning environment (ILE) with one other teacher. In 2018, I was a Manaiakalani-Google Class on Air teacher. This year, 2019, I am one of the Manaiakalani Innovative Teachers. In this blog, I will document my professional inquiry and learning as a teacher. Today in maths professional development with Don, we have been thinking about the importance of giving all the children status in the classroom. It is really important that we recognise the different talents that different children bring to the class and that we acknowledge that every child has value to bring to a lesson. - If someone asks for help, you can’t say no. - Give children control by giving them the chance to ask someone else for help, or they can say “Can you come back to me soon?” - children have knowledge that the teacher will come back to them. - Get a child to repeat another child's response instead of having to come up with something new. By doing this, all children are made to have responsibility for their learning and there is an expectation that all children have value to add to the lesson. Today the MIT19 PLG met at KPMG to continue on from where we left off at our MIT Hui three weeks ago. We began by sharing what is working and what we are finding challenging/ what we need help with. What is working: The children in my class are keen learners who are enthusiastic to try new things. In the cybersmart lessons I have taught so far this year, they have been keen to learn more. In addition, finding out about Interland has been fantastic! My learners are highly engaged in it and the game has very clear learning intentions set out for young learners. This will fit in nicely with the creation of my tool to enhance cybersmart learning. What I am finding challenging: My big challenge at the moment is how I am going to measure student learning throughout the year. With inquiries based around reading, writing and maths, there are standardised assessment tools which have been proven to be effective. However, this is not the case for measuring key competencies (thinking; relating to others; understanding symbols, languages and texts; managing self and participating and contributing) and for assessing cybersmart learning. These are people who I should be approaching over the next couple of weeks to ask questions to help provide direction in my inquiry in terms of what the greatest needs are and how to best measure student learning. She emphasised the importance of learning being active. This is important to retain learner attention. This includes the process of being metacognitive with the children. This process of metacognition is something which we are always looking into and is a huge part of the way we do maths in our school (DMIC maths). Jannie discussed the importance of detail. She talked about how it is easy for the default to become less detail however as teachers, we should constantly be trying to pull more detail out from the children. Another thing that Jannie talked about which matches messages we have received from the DMIC mentors who come into the classroom is the idea that expecting hands up is something that is hindering language. Jannie challenged us to think about whether this is something that is common across the classrooms in our school and also across our schools in Manaiakalani. I strongly believe this is a common occurrence and is something which we are constantly reflecting on, particularly in maths. 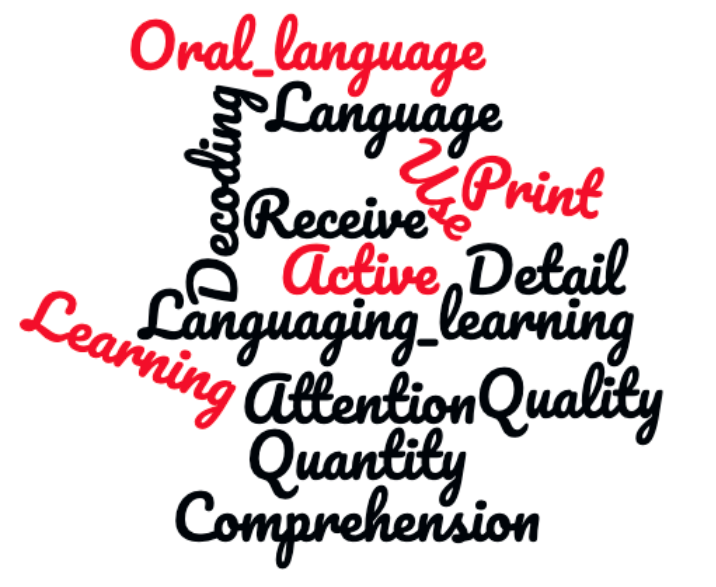 A challenge to myself is to think about how I can extend this understanding to reading and writing so that language acquisition (particularly oral language) is a focus right through the school day and then also into the digital world when children are learning from home. 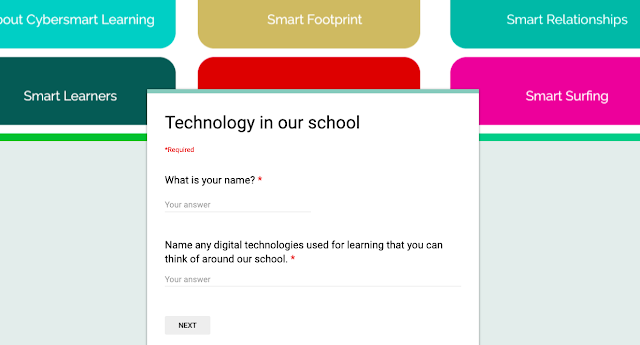 I have designed a quiz to gather initial data from the children in my class around their current digital citizenship and, in particular cybersmart knowledge. When creating this quiz, I referred to the pedagogical knowledge I have been developing over the past weeks (see blog post). I then developed questions which were meaningful to the children. We often hold high expectations of what our children are actually capable of doing and thinking when using digital technologies as a tool for learning. I wanted to ask questions which would allow me to figure out whether these expectations we hold are true or not. Here is the quiz. For each question, I will explain what part of digital citizenship is the focus. Section 1. Name any digital technologies used for learning that you can think of around our school. Section 2. Where would you find these symbols from google? - Digitally capable, Being "literate in the languages, symbols and texts of digital technologies"
Section 3. Write a quality blog comment in response to a blog post. Section 4. Write a reply to a blog comment on a class blog post. Section 5. Smart Relationships. What should you do if you want to use a photo of someone else on your blog? Section 6. Passwords. Miss West wants to create a strong password for her new coding app. She really likes the song Million Dreams. What password could she create using the song Million Dreams to create the password? Section 7. Knowing or knowing where to find google shortcuts. Section 8. Write down 3 ways we can look after our Chromebooks in class. Section 9. Read an article (provided). Do you trust this article? Write down some things to explain why you do or do not trust this news article. Section 10. Sharing ideas. Write down 3 different ways you could share ideas online. Being confident, digitally capable, Being "literate in the languages, symbols and texts of digital technologies"
April Fools! - A perfect opportunity to teach children to be critical online! Can we trust everything that is online? NO!! That seems like such an obvious answer to us as adults but is it that obvious to children? Every morning, my class explores kiwikids news. We scroll through the headlines and the children get to choose a couple of articles to read as a class. Today, I stumbled across this news article. I knew straight away that this was an April Fools prank, but I wanted to see how the children responded as I read the article aloud to them. The first half of the article seemed pretty reasonable and used language which didn't cause any suspicion. It wasn't until I began to read the paragraph which said that the reason for daylight saving being changed was to support the Prime Minister with her young child's sleeping patterns that a couple of children started giving each other puzzled looks. Some children interestingly still did not see anything amiss. It was really interesting to see that only a small number of children actually realised that this article wasn't quite right as they read. They were showing that they were able to think critically about the text and make a decision as to whether they trusted the information or not. What was equally interesting was the large number of children who didn't realise that this article seemed a bit odd until the very end when it stated that it was an April Fools joke. This showed the importance of teaching children to be critical about what they read from a young age. Clearly, children in year 5 are capable of learning the skills to be critical when reading information (as observed by some of the children's facial expressions). This experience was a great way to teach learners that they can't trust everything they read online. I am keen to find more articles like this to continue to develop this aspect of the cybersmart curriculum. Kāhui Ako Achievement Challenge 5: Improve the achievement of students with additional needs in the learning areas of English/ key competency using symbols, languages and texts. My Inquiry Problem/ Challenge: Children living in a digital world, where key competencies are essential, require ubiquitous access to cybersmart scaffolds and resources which are not currently available. The Manaiakalani data from 2018 shows a vast difference in progress and achievement in writing compared to reading. While Manaiakalani writing data appears to get closer and closer to the national norm between year 2 and year 8, the reading data does not. In fact, when tracked over three years, the reading data remains almost parallel to the national norm. While writing data, when tracked over three years, does move up and down a lot more (due to the summer drop off, which is being addressed by the summer learning journey), the data does move closer to the norm over the years. This area of the data presented to us from Woolf Fisher is important for me to consider in my inquiry as it supports the importance for teaching cybersmart to support children in their reading. We have an amazing resource available to us for teaching and learning however we aren't able to utilise this to it's full potential if we aren't supporting children by providing the essential skills required to be critical with information which is read online. Even so, through my inquiry, I am going to have to explore ways to measure student learning through the key competencies. We are fortunate to have a number of standardised tests to measure how children are doing in reading and writing. However, we don't have the same tests to measure how children are doing in their learning of key competencies. Tools/measures/approaches I plan to use to get a more detailed and accurate profile of students’ learning in relation to my challenge. - Student survey (beginning and end of year): This survey will include a number of questions to test what children know about making smart decisions online. Doing this survey at the beginning and end of the year will create a way I can measure children's knowledge of cybersmart and use of key competencies when making decisions online. - Teacher survey (beginning and end of year): This survey will include a number of questions to gain information about how teachers are currently teaching cybersmart in their classrooms and the areas of the cybersmart curriculum which they judge to be the most essential for the year level they teach. This information will help me to see if there is a particular progression of student learning in cybersmart throughout the years at school (between year 2 and year 8). - Cybersmart 'Tip clip' tool (to be created by the children): This tool is going to be developed and designed throughout the year by children in my class as they learn about different aspects of cybersmart. The idea of this tool will not be to teach the curriculum but to create a ubiquitous, visible and engaging tool for children which will reinforce elements and remind children of certain elements of cybersmart which are necessary in order to make critical and thoughtful decisions online. Through the creation of this tool, I will make observations about how children approach various situations where they have to think critically or problem solve. - Record/Log of times when children have had to think critically or problem solve online: This measure will be an important collection of information to keep track of the areas of cybersmart which children are most challenged in terms of making critical decisions online. This will help to paint a picture of areas of the cybersmart curriculum which may need to be addressed throughout the year. In our CoL meeting last week, Dr Aaron Wilson talked about valued learning outcomes. These are not always easy to measure but are things which we see as of value in our community (that is, at school and the wider world). When thinking about my inquiry into the cybersmart curriculum, I realised that a lot of the measures which I am going to be using are going to be based on valued learning outcomes. That is, I am not going to be able to use readily available data like PAT data, running records and e-asttle data which is often analysed for reading and writing. - Key competencies, in particular thinking; relating to others; understanding symbols, languages and texts and managing self. - Affective outcomes, particularly around attitudes and beliefs. - Prior knowledge and common sense that children hold about relating to others online. - Prior knowledge and common sense that children hold about managing themselves online. - Being able to think critically if children find themselves in a different or new situation online. - Being able to navigate through the digital world of the internet. - Being able to respond in a kind and thoughtful way to others online. - Being able to leave a clean digital footprint - i.e. how you portray yourself publicly.